Treadmills are the most common used piece of equipment in the gym but did you know that many of us, young and old, are using them incorrectly? What are so many of us doing wrong on a treadmill? We are holding on. Being nervous using the treadmill your first few times is one thing. However, if you are holding on because the speed is too fast or you're at an incline too steep then it's time to slow down, drop the incline and let go. You burn far fewer calories vs. letting go at that same speed. It throws off your walking gait and posture (remember many of us sit a desk all day at work - the last thing we need to do at at the gym is to hunch over while walking on a treadmill). It can cause stress injuries, especially in the hips and shoulders. It can also aggravate pre-existing injuries. It can create a false sense of accomplishment. Could you walk that same incline (hill) outdoors? Letting go will help you to prepare for walking hills outdoors. If you are holding on, you're not alone. If you're not feeling comfortable on the treadmill and have a fear of falling off, remember it's important to attach the safety clip you'll find on each treadmill. If your safety clip comes off while walking or running, the treadmill will automatically stop. Start off at a slower pace and decrease the incline until you feel comfortable and eliminate the need to hang on to the rails. If you are still unsure of yourself and need more education on using a treadmill properly, sign up for our Cardio Basics 1-hour course at the front desk. 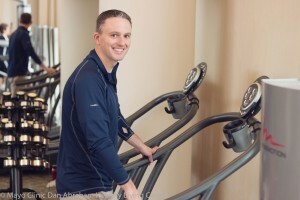 We will do our best to get you comfortable using a treadmill without needing to hold on.